7378 were produced from October 1941 to February 1946. 8-10 x 7.69 or 2×12.7 + 6 x 7.69 (Mk.VII, Mk.X), up to 6400-10000Kg of Bombs. Slab-sided Fuselage with heavily-framed Canopy mounted well-forward on the Upper Fuselage. Nose, Tail & Upper Rear Fuselage contain Turrets housing defensive Guns. Twin Tail unit with un-swept horizontal surfaces. The main Undercarriage housed in the Cowlings of the Inner Engines. Some Aircraft had the H2S Radar Bulge aft of the Bomb-Bay while a few other carried a Mid-Lower Gun-Turret. 2 x .303 Browning machine guns in Nose Turret, 2 x .303 Browning machine guns in the Mid-Upper Turret and 4 x .303 Browning machine guns in Tail Turret. Early models also had a Ventral Turret with a single .303 machine gun. Special versions were stripped of Armament to carry increased Bombloads. There is no hiding the fact that the lineage of the Lancaster was ﬁrmly embedded in the Manchester whose failure, with the beneﬁt of hindsight, resulted in one of the most signiﬁcant Aircraft to serve with the RAF during the WW2. Within a short period of time the 3rd 4-engined ‘Heavy’ to join Bomber Command completely over-shadowed the established Stirling & Halifax, with extraordinary operational statistics and its involvement in high-proﬁle Missions. The hard work of development, including the general layout of the Fuselage & Aircraft Systems, was already in place before it was decided to upgrade the Manchester with 4 Merlin Engines. A single Manchester Airframe was withdrawn from the production line and ﬁtted with an enlarged Wing to which were attached 4 under-slung 1,145hp Rolls-Royce Merlin X Engines. The Prototype referred to as the Manchester Mk III and Serial No.BT308 also retained the original Bomber’s Central Fin and 22ft Tailplane. It was 1st Fown from Woodford on January 9, 1941, the Aircraft was ﬂown to the A&AEE at Boscombe Down 18 days later. The 1st production Lancaster Mk I, Serial No.7527, made its Maiden Fight on October 31, 1941. Power was provided by 4 x 1,280hp Merlin XXs driving de Havilland 3-bladed, constant speed Propellers that could be fully-Feathered. Within a year of the Lancaster entering service the production rate was climbing (peaking at 155 Aircraft per month in August 1944 by Avro alone), enabling 5 Group to re-equip 10 Squadrons, 1 Group with 5 Squadrons and another with 3 Group. The newly formed 8 (Pathﬁnder Force) Group also initially operated 2 Lancaster Squadrons and it was the ambition of its AOC, AVM Don Bennett, to make his Force an all-Lancaster & Mosquito affair as soon as was possible. The most obvious diﬀerence between the Mk II and all other Lancaster Marks was the Engines; initially, the 1,650HP Hercules VI which were later superseded by the Hercules XVI. The latter Engine, in particular, gave the Lancaster similar performance ﬁgures to the Merlin-powered machines although the Service Ceiling was restricted to just 18,500ft and Fuel consumption was higher. One other diﬀerence between the Hercules & Merlin was that the former’s Rotol Propellers rotated to the left while the latter’s rotated to the right. The Mk II also featured an extended Bomb Bay which was 1st trialled on the 2nd ‘production’ Lancaster prototype, DG585. This Bomb Bay was designed to accommodate the 5,500lb Capital Ship Bomb, but the Weapon was aerodynamically unstable and virtually impossible to Aim accurately resulting in it being abandoned later. The Mk II was also ﬁtted with an aft facing FN.64 Ventral Gun Turret which had a Field of Fre of 100° either side of the centreline. The Capital Ship Bomb had been in development for 2 years before it was felt that it was ready for use. For its day, it was very large, and originally it was intended that the Manchester would carry it, as it was the only British bomber in Service with an uninterrupted Bomb-Bay large enough. However, as the Manchester proved to be plagued by Engine problems, a modified Lancaster seemed the obvious choice. A full-scale trial of the CSB was carried out at Boscombe Down on 8 May 1942 using the 3rd production Mk I Lancaster L7529, its Bomb Bay having been enlarged by bulging the doors. Although the Bomb missed its Target on this occasion, production examples were produced & delivered before the end of July 1942 to 106 Squadron for Operational use. The 1st such Operation was on the Docks at Gdynia (Poland) on the night of 27/28th August 1942 with 3 Lancasters but was a total failure due to unexpected Cloud over the Target. However large flashes indicated that Detonation was satisfactory. Thus the so-called Lancaster ‘Provisioning’ with Bulged Bomb-bay Doors was born, and the best unit available was chosen to carry out the 1st Raid on Gdynia and the half-finished Carrier Graf Zeppelin. The Battleship Gneisenau was also present but was apparently only a Secondary Target. 2 copies of modified Lancaster I and 7 copies of modified Lancaster III without Front & Upper Turrets, equipped with improved Radar & Radio-Frequency Interference Equipment. The Lancaster Mk.VI was the result of a proposal to improve the performance of the Mk.III by installing a quartet of 1,750hp Merlin 85 Engines. Two Mk IIIs, DV170 & DV199, were despatched to Rolls-Royce at Hucknall on June 16th & July 6th, 1943, respectively for conversion. A further 7 Mk.IIIs were converted to Mk.VI standard for Service Trials, several examples going on to serve with 8 Group as part of 635 Squadron complete with a faired over forward Turret and no Dorsal Turret. The maximum speed of the Mk.VI was 313mph at 18,000ft but one Aircraft, ND558, achieved the Lancaster record when it reached 350mph (Mach0.72) in a dive during Tests at Boscombe Down. The Mk.VII diﬀered from all other variants by its Dorsal Turret, which was an American-built electrically-powered Martin furnished with a pair of 0.5in Browning machine guns. The Turret was positioned over the Rear Bomb Bay, which was further forward than the original Frazer-Nash Turret. Post-war the Bomber was referred to as the B.7 and a tropicalised version was designated as the B.7 (FE). The ‘Far East’ Variant was to have formed the backbone of the RAF’s ‘Tiger Force’ against the Japanese, but thankfully the War ended before the Type saw action. 430 copies by Canadian Victory Aircraft Ltd.
Part of the 1st production batch of 300 Aircraft built by Victory Aircraft Limited, Malton, Ontario, Canada. KB700-KB999 (produced ‘before’ the FM-Serial batch). Packard built Rolls-Royce Merlin 38 Engines in the 1st 75 Aircraft; Merlin 224 Engines in the subsequent Aircraft. Deliveries commenced to Britain 9-43; completed 3-45 (average rate of production, approximately 4 Aircraft per week). Part of the 2nd production batch of 130 Aircraft (from an order of 200) built by Victory Aircraft Limited, Malton, Ontario, Canada. FM100-FM229, (Aircraft built ‘after’ KB-Serial batch). Packard built Rolls-Royce Merlin 28, 38 or 224 Engines. Majority of Aircraft shipped to Britain between March & April 1945, some of which served with RCAF Squadrons in Britain and most flown back to Canada in August 1945. Also, many special Bomber modifications were produced – for heavy 3632 kg, 5448Kg & 9988Kg (Grand Slam – the heaviest WW2 Bomb) Bombs, for bouncing cylindrical Bombs of Wallis type (Dam-busting raids), with Radar H2S, etc. For example, 33 copies of Lancaster I Special were produced for carrying super heavy Grand Slam Bomb (enlarged Bomb Bay without doors),. Tropical Variants Lancaster F.E. Mk.I for Australia & New Zealand (didn’t see Action during WW2). Main Operations: Night massive Bombing of Germany, Italy, France from March 1942 as the main British Heavy Bomber, Day massive Bombing of Germany since September 1944, damage (Raids from Soviet Arkhangelsk, 15th September 1944 & 28th October 1944) and destruction (raid from Scotland, 12th November 1944) on German Battleship “Tirpitz” with 5-Tonne “Tall Boy” Bombs, Bombing of German Missile Scientific Centre at Peenemunde in August 1944, bombing Hitler’s Residence (Eagles Nest) in Bavarian Alps in Spring 1945. 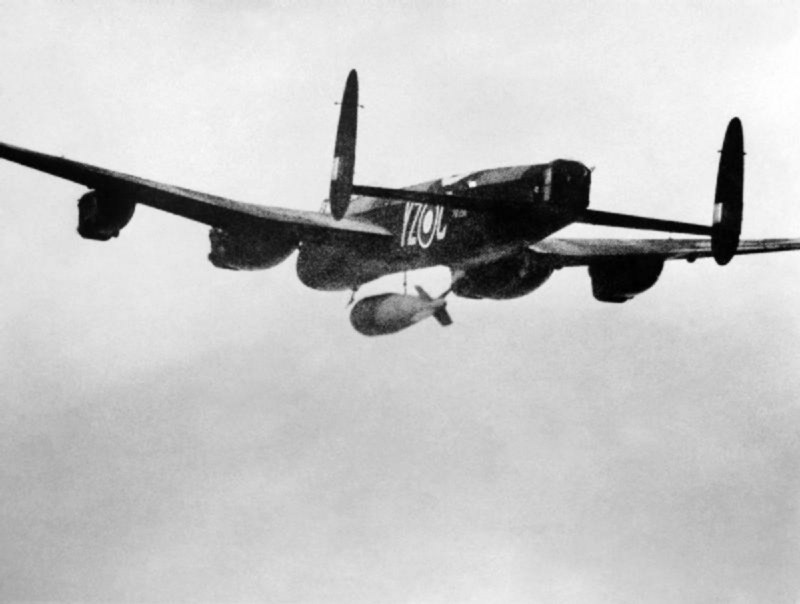 The most famous use of the Lancaster was probably the 1943 Mission, codenamed Operation “Chastise“, to destroy the Dams of the Ruhr Valley using special Drum shaped Bouncing Bombs designed by Barnes Wallis, and carried by modified Mk.IIIs (nevertheless, 8 from the 19 Lancasters were shot down). Lancasters were very good Heavy Bombers despite the fact that their predecessor Avro 679 Manchester had 2 unreliable Engines – Rolls-Royce Vulture (1160HP each). Lancasters with much more better Engines Merlin had excellent Bomb capacity, good Flight performance, powerful Armament & High Endurance. Early models of Lancaster suffered from unreliable Wing Construction (several accidents happened during manoeuvring when wingtips were broken by Airflow), later wings were improved. Also Mid-Upper Gunners quite often damaged the Tail Units with their Machine Gun Fire so the special Restrictors for Turrets were installed. More than 156,000 Combat Flights were made by Lancasters, they dropped 618350 tons of High-explosive & 51.000.000 Firebombs. 57 Squadrons of RAF were equipped with Lancasters. They were used by UK & Australia, USSR repaired & re-equipped 2 damaged Lancasters (one was used as Transport Plane in No.16 Squadron of White Sea Flotilla AF and another as Transport Plane in 70th Transport Regiment of North Navy AF). Probably, 3249 Lancasters were lost in action (almost 50% of the used Lancasters). One of the 1st heavy losses took place on 17 April 1942 near Augsburg when 7 from 12 Lancasters were shot down by German Fighters and Ack-Ack Fire (that was a Day Raid without Fighter Support against a Submarine Shipyard). Only 35 Lancasters completed more than 100 successful Operations. The greatest survivor completed 139 operations and survived the War, to be scrapped in 1947. According to RAF Statistics for 1943 one Short S.29 Stirling was lost for every 49 Tons of dropped Bombs, one Handley Page HP.57 Halifax was lost for every 56-T of dropped Bombs and one Avro 683 Lancaster was lost for every 132-T of dropped Bombs. There were 16 known Avro Lancasters remaining in the World, only 2 of those until recently remained in Airworthy condition.